I've been meaning to publish this news for a while - it's from Instituto Allegro, a Nashville-based, international, Christian worship music school. 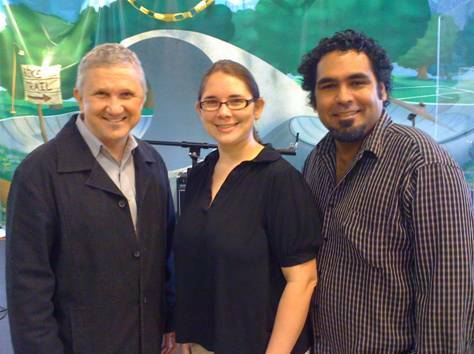 In December 2010, Instituto Allegro / Músico a Músico of Nashville introduced students and teachers to their new director Dimas Espinoza. Espinoza, a dynamic educator and musician, brings to the position his extensive pastoral and music ministry experience. "We want Allegro to be pertinent and relevant within the Kingdom of God," affirmed Dimas as he spoke to students and teachers shortly after the announcement. Wayne Hilton, director of Músico a Músico, the sponsoring agency of Instituto Allegro in Nashville, expressed his satisfaction in finding the right person for this new stage of the Institute. Espinoza has 5 years of history within the Músico a Músico / Allegro family of ministries where he has taught Ministry Class, Theory, Music Reading, Drums, and Keyboard. Instituto Allegro has been in operation for the past two years under the leadership of Rachel Vásquez, whose service has allowed the Institute to achieve its wide recognition in the community thus far. Vásquez shared the decision to turn over the leadership position due to a response to a call to serve the Lord in Bolivia with her husband, Ramiro Vásquez, also a teacher in the Allegro family. "We know that God will continue using you in a great way during this new chapter," added Hilton. During this trimester Rachel will continue to be active in the institute to assist the new director in having as smooth a transition as possible. Instituto Allegro hopes to continue fulfilling and expanding the vision to equip all those called to serve within the music ministry. Instituto Allegro offers general music theory classes as well as instrumental classes for guitar, keyboard, bass, drums, and voice. Classes meet each Saturday from 9:00 am to 2:00 pm at Christ Church located at 15354 Old Hickory Blvd, Nashville, TN 37211. The most recent trimester started February 26, 2011. For more information contact phone: (615) 768-9422, or visit the school's web site at: www.institutoallegro.org.